The tweet arrives around noon on Saturday, Dec. 11. The information traveling through the crowd is repeated, digested, repeated again. Finally, like the long-delayed report from the starting gun of a foot race, the masses are off, a red river of empowered lemmings bustling and "ho-ho-ho-ing" their merry way down Sixth Street toward Clifton's Cafeteria downtown, the first of many designated stops for these sweaty Santas. Welcome to Santa-Con L.A. 2010, an annual event in which costumed revelers rove around and generally have a good time. Santa-Con bills itself as both secretive and anarchistic. In fact, it is neither. Take a look at the official website, which lists, by date, the various Santa-Cons in cities around the globe. I'm sure the allies took out ad space in the Berlin Dailywhen planning the D-Day invasion, so the Santa-Con announcement is consistent as far as secret plans go. Granted, you must have purchased a ticket to the event to find the official start location, and to do that you must have been forwarded the info from a friend, or a friend of a friend. But friends are easy commodities in these days of viral social networks. 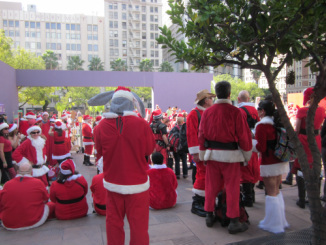 By the Thursday before the event, the starting point and time had already been announced: 500-plus easily concealed Santas will slip undetected into Pershing Square at 11:30 a.m. Even without having to call in WikiLeaks, word is out, and several hundred thirsty Santas are eager to get started. And then, of course, there are the rules, because all anarchy relies on strict sets of rules. Santa-Con has several paragraphs of them covering how the Santas were to behave in public, transportation dos and don'ts and the dissemination of information. Remember, "Loose lips sink Santa-laden ships." There's even an easily memorized name-rank-serial-number script to follow in case security personnel or, worse, a Santa "mole" interrogate you. "Who's in charge?" "Santa." "Who organized this?" "Santa." "What organization are you with?" "Santa." One can only wonder how long such resolve could hold up to waterboarding. By 1 p.m. the next of the marching orders arrives and the crimson flock obediently begins bleating its way to the next "secret" location. Somewhere in the sky overhead is a giant spaceship that serves as the nerve center for Santa-Con control, its choreographed moves steering this "free-thinking" mob of Santas to the locations deemed worthy of them. Unlike a truly organic and viral lark where several friends don red suits and hand out candy canes or colored beads on a street corner, Santa-Con has devolved into the very thing it once proudly railed against. It has organization, structure, rules and even, it appears, a marketing arm. Several months before the event, planners e-mailed past participants a survey with questions such as, "Which type of transportation do you prefer for Santa-Con, bus or rail? How much would you be willing to pay to attend Santa-Con?" etc. Well-researched and thoughtfully designed Santa-Con merchandise and an iPhone app no doubt are soon to follow. Hopefully, a Santa-Con reality show starring the entire Palin clan is already in the season lineup for next fall. As for me, I'd love to stay and discuss all of the great possibilities, but a tweet just came in and I have to get moving. I don't want to find myself labeled a "Bad Santa."